As you and your friends put on “urban design glasses” and explore your community for the Walkshop, here’s some food for thought. It starts with people. Who uses this area of your community? What draws them there? Different people are there for different purposes at different times of the day and the week. Different age groups experience a neighborhood or part of town differently. What might cause people of all kinds to walk several blocks? The answers involve both design and human behavior. Ground level visual interest. An example: a block lined with engaging retail shops or restaurants with sidewalk tables seems a lot shorter than one lined with parking lots, vacant or windowless buildings. Relief from weather. People want shade in summer, and sun in winter. People want shelter from rain and snow. Sense of safety. A complex set of factors contribute to it. •Moving cars can be dangerous to pedestrians, especially those who aren’t as frisky as they once were. Where there is physical or psychological separation from moving traffic there is likely to be more pedestrian activity. •Dark can also add to anxiety. In addition to municipal street lighting, observe how lights from store windows and signs add to the ambience (and sense of safety) downtown after dark. Connections / Barriers. Sidewalks, pathways, trails connect features and destinations. Barriers can be physical: fences, barricades, dead ends are examples; or psychological: underpasses, elevated highways, un-shoveled winter sidewalks, wide arterial streets for instance. To lengthen the pedestrian experience beyond ¼ to ½ mile, the presence of easy to use, frequent transit can be another connection. Cleanliness. Walkable environments are clean. There are trash and garbage receptacles, and streets and sidewalks are frequently swept clean. Destinations. People will walk several blocks to a destination (if the route is interesting). The destination could be a restaurant for lunch, a park with seating and programming, an event at the Arena, a museum, farmers market, street art fair, an office or shop. Beautiful landscaping. Green spaces, street trees, well-maintained plantings all add to the attractiveness of downtown at the pedestrian level. Water and Art. Water features – rivers, fountains, pools, and outdoor sculpture and art installations can add to downtown’s attractiveness and “walkable urbanity.” Public art is already a presence in downtown. Wichita’s extensive downtown river banks invite imagination! Neighbors and People. For downtown residents, doing errands on foot, walking the dog, bumping into friends along the way are all part of the attraction of living in the center of things. The more there is to see and do, the better the connections, the fewer the barriers, the more attractive downtown will become as a place to live as well as to work or shop. While Walkshops focus on a range of issues from housing, to economic development, to parks and public spaces, a logical and common theme is walkability. 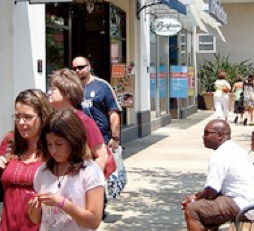 The following piece written by Mary Means, formerly with Mainstreet America, talks about what makes a community walkable.